You are here: Home / Exercise / What is Tabata? Imagine that you could give your body an exercise makeover with short, 4 min workouts. Thankfully, a type of high intensity interval training called Tabata makes it possible. HIIT training has been all the rage lately and with good reason. It’s exciting, the workouts can be relatively short and many people feel that it delivers results more quickly. High intensity interval training can be found as classes in almost any gym. It’s a part of a lot of “Crossfit” style workouts and it can be found in Workout DVD programs, like Insanity. Tabata is equally, if not more, effective and can be done in less than a ¼ of the time of an average CrossFit workout. Tabata is named after Dr. Izumi Tabata of Japan. Dr. Tabata is a researcher and a physician that focused on a particular study involving high-intensity interval training. The doctor discovered one very effective method involving a 20/10 8 rep workout. This means the person worked out to their maximum limit for 20 seconds, followed by 10 seconds of rest. This is repeatedly in 8 reps for a total of 4 minutes. Dr. Tabata’s theory proved to be extremely successful, with his study participants achieving a 28% increase in their anaerobic fitness level in just 6 weeks. Participants who did traditional moderate exercise spent an additional 1,680 minutes training yet they didn’t achieve anywhere close to the same success. Tabata set out to show this with a simple experiment. One group of moderately trained students performed an hour of steady cardiovascular exercise on a stationary bike five times a week. The other group did a 10-minute warmup on the bike, followed by four minutes of Tabata intervals, four times a week – plus one 30-minute session of steady exercise with two minutes of intervals. This research further cemented the power of high intensity interval training. Any person, fit or not, young or old can make Tabata work for them because maximum effort is relative. What that means is that giving 100% for someone who has a knee injury may be different than someone who doesn’t, but both can find intense, safe exercise that could be put into the Tabata model. Chronic exercise, or repeatedly exercising in strenuous ways on a regular basis, can cause injury to even top athletes. The human body is capable of marvelous things, but even the healthiest person can develop injuries from strain related to excessively working out. 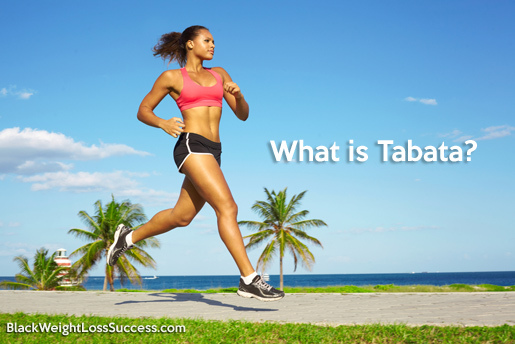 Though Tabata is very high in intensity, its short duration is ideal for preventing injury. Now, that is not to say that injury won’t happen. You can get injured just walking off of a curb, so you still have to be careful when you are working out with high intensity and practice good form. One of the most common excuses for not working out is, “I don’t have the time”. While almost everyone has too manage their time wisely, there really is no reason you can’t do a short Tabata workout. After all, who doesn’t have 4 minutes? You could break your workout into AM and PM to have more time for more than one 4 min round. High intensity interval training burns more fat and delivers results more quickly than traditional training methods. You can put all your effort into a few minutes of high-paced exercise rather than 1/2 hour of low to moderate exercise. HIIT training, like Tabata may help you reach your goals much more quickly while also saving time. A common problem on many weight loss journeys is hitting a plateau that makes you feel like nothing can get you over the hump. Tabata is perfect for jumpstarting your weight loss or muscle gain. Throw a 4 min Tabata workout into your current workout mix to shock the body and challenge yourself. Test it out. There are not promises, but it just may do the trick. Tabata is a very beneficial addition to most any workout regimen. A bonus advantage is how easy it is to start this training. Don’t forget to warm up for at least 3 minutes and take the time to cool down properly. Stretching during your cool down is very important to ensure you don’t wind up unnecessarily sore the next day. If you enjoy working out in a gym you may want to see if you can find Tabata classes in your area. If this isn’t an option, you can look on YouTube or do a Google search to find videos to work out along with in the comfort of your own home. Tabata training can be a ton of fun and a refreshing, albeit exhausting, way to change to your routine. Regardless of whether you are a long-time gym member or brand new to structured workouts, Tabata could help you achieve the goals you have set for yourself. *Disclaimer: Before starting any exercise program, please consult with your doctor. We cannot be held responsible for any injuries resulting from attempting this exercise routine. If you have injuries that could be worsened, are pregnant, have knee issues, or are suffering neck and back pain, you should speak with a professional trainer about what workouts would be best for you. Do not attempt if you have current injuries, past surgeries or other physical issues/health issues that could be affected by exercise. Don’t forget to stretch before and after working out to avoid injuries.